Happy Friday! 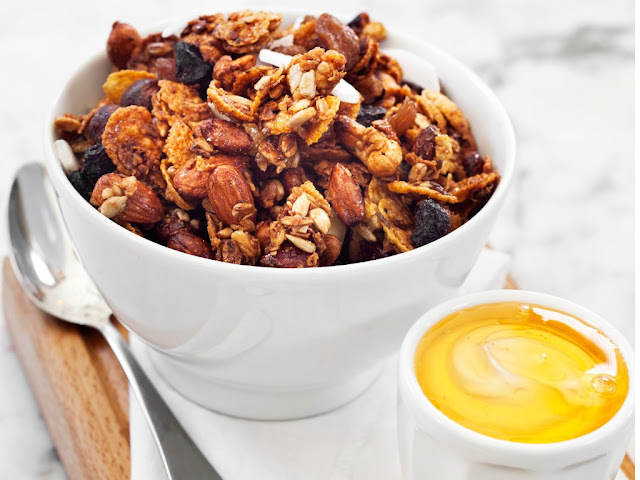 We are getting ready for the weekend over here and part of our plans include this yummy, grain-free granola that has been on repeat the last few weeks. I should be a little embarrassed about how many batches of this I've had to make but it's so good I don't even care! Full recipe below friends, ENJOY! 1. Preheat oven to 325 degrees F and line a cookie sheet with parchment paper and coconut oil. 2. In a large mixing bowl, combine first six ingredients. 3. In separate glass bowl mash banana and then add honey, coconut oil, maple syrup. Heat in microwave until coconut oil is melted and mixture is warm (about 30 seconds). 4. Combine with vanilla and cinnamon then pour liquid mixture over dry mix and fully incorporate. 5. Spread evenly on baking sheet and bake for 20 minutes. 6. Remove from oven and add raisins. Use wooden spoon to incorporate fruit and break a part current mix. Then increase temp to 345 degrees F.
8. Store in mason jar or air-tight container and ENJOY over fruit, yogurt, salads or with a nut milk! I’m honestly not sure how long it will keep because we eat it SO FAST!! This isn't a super sweet granola but you can increase the sweetness by adding 3 Tbsp of coconut sugar or honey. I hope you and yours enjoy this as much as we have!